IRVING, Texas–(BUSINESS WIRE)–OnAsset Intelligence Inc., a leading provider of machine-to-machine (M2M) wireless asset tracking, sensing, and control solutions, and TransCore, a worldwide transportation services company, today introduced a turnkey M2M service application that enables customers to pay for cargo security per day of active use while the cargo is in transit, making it easy for customers to track and monitor high-value cargo on a per shipment basis. For as little as $7 per day, customers can pack and ship a container with OnAsset’s ContainerSafe™ device, utilize TransCore’s complete forward and reverse logistics program, and monitor the device from point of origin to destination in real time over T-Mobile’s global network — all without paying a huge upfront capital expenditure to make it happen. “This business model demonstrates that the M2M industry continues to not only provide innovative enabling technologies, but also unique business models that create a service infrastructure for high-value asset tracking,” says John Horn, national director of M2M for T-Mobile USA. 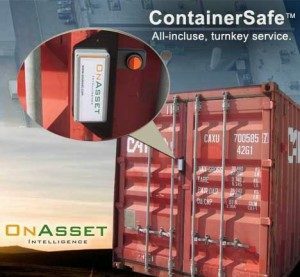 Designed for self-service monitoring of most shipping containers, OnAsset’s ContainerSafe products can be equipped with multiple sensors to track location, monitor the status of the container and goods inside, and to deter, detect, and delay theft. Installed or removed in less than one minute, the devices are so easy to use and install that no tools are required. Breach detection sensors are utilized to ensure that once the container is loaded, no attempts to reopen the container during transit can occur without notification. Unlike the one-time-use container seal locks often used today, ContainerSafe devices are reusable and designed to be an integral component of any intermodal carrier’s cargo security strategy. TransCore is a transportation services company with more than 1,800 employees and 80 locations throughout the world. With installations in 46 countries, more than 100 patents and pioneering applications of internet-based logistic applications, RFID, GPS and satellite communications technologies, TransCore’s technical expertise is unparalleled in the markets it serves. For more information, visit www.transcore.com.